While working on my tray I tried both Krylon and Rust-Oleum's clear lacquer sprays. In my opinion there is NO COMPARISON! While I try not to bad mouth products on here (I'd rather just not mention them) I had to share with my readers the difference between the two of these. I used Krylon Lacquer first and it was not clear or smooth looking. It was foggy and didn't have that even finish that I was looking for at all. I was really disappointed with the results. I was so upset that I thought I had ruined my tray and all my hard work. I used my mouse sander and sanded down the clear layer without ruining the zig zag pattern (use a 220 grit sand paper or finer for this) and decided to start over. This time I tried the Rust-Oleum Clear Lacquer Spray and crossed my fingers. BINGO, It worked like a charm! Best spray lacquer out there, I will NEVER go back. It gave my tray the even, smooth and CLEAR finish I was looking for. It even looks like a professionally manufactured tray, it's so pretty! * I know I'm no expert spray painter, but I have done my share of spray painting lately and I would have to say Rust-Oleum Lacquer Clear Spray is the clear winner (no pun intended). ** And NO, they are not paying me to say this or providing me with free spray paint- this is just my opinion. I'm guest posting over at DomestiKatedLife. today. Head on over to check out my favorite Back To School Supplies. Thank you for sharing this. I know the frustrations of being so close to the end and then having a simple detail nearly ruin it. You have most likely saved some of us the frustration. so good to know. We have a few projects in the works and this is key, thanks! Rustoleum is great. I don't even mention the word (krylon) around my house. I make blackbords for gifts and used the (kryon)and it ruined them! I was almost carried away by security at Walmart because I demanded my money back. Note to readers, they don't refund money on paint FOR ANY REASON. 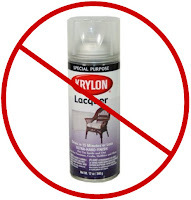 I got my money back, but will not buy (krylon,) nor will I buy paint from Walmart! 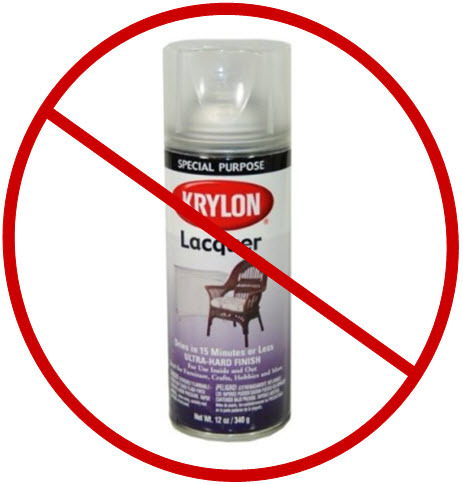 I am SOOOO with you - I thought I ruined the top of my desk (which I had just spent forever staining) with Krylon. Rustoleum from here on out!! How fabulous would it be to get paid and get free spraypaint though!!! Sad what thoughts excite me. Good to know! Great tips. How's it going? When are we hanging out?? Thanks for sharing. Any chance you know whether this can be used over white paint? I've tried some sprays that turned my whites yellow. BTW, the pillows I won from your giveaway will be making an appearance on my blog on Thursday-along with a little shout out! I'm loving the way they look on my white sofa. So good to know and I'm glad you were able to save your tray!! Filing this away for future reference. I loved that tray, btw! whatevs, you probably have a whole box of free spray paint in your living room. I have a brass chandelier in my living room floor with your name all over it. Pick me a color!!! What goes with kelly green? good to know...i've always wondered about the lacquer spray paint. taking a mental note thanks! I certify that this post is 1,000,000% correct. 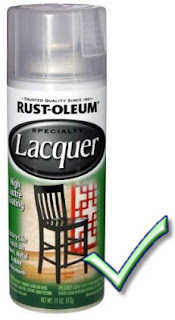 This is why I love blogs; even though I am not even exactly sure what kind of a project I would use Rust-oleum for, I am glad to know that Rust-oleum is better than Krylon! Thanks. And now I want a project to for Rust-oleum lacquer! I hear you- Rustoleum makes such better spray paint than Krylon. I always use Valspar and have had alot of luck with it, but I don't think they have as many color choices. (Or at least not at Lowes). Good to know - thanks for sharing! This is such a helpful tip. Thanks! Phew. Just double checked my lacquer spray paint and looks like I'm good to go. I could've very well went with the Krylon but the Rust-oleum was the only option. Kimberlie, I'm not 100% sure on that- you might want to check with your local paint person. I know i have asked them about 1000 questions and they are really helpful with finishes and paints etc. Sorry I'm not more help!